1 Spray a 5 quart slow cooker with non stick cooking spray. 2 Combine brown sugar and butter in a microwavable measuring bowl, microwave uncovered on High for 1 to 2 minutes, stirring every 30 seconds, until brown sugar and butter is smooth. 3 Combine granulated sugar and cinnamon in a resealable plastic bag. Separate dough into 8 biscuits; cut each into fourths. Add a few of the biscuit pieces at a time to bag; shake to coat. Scant 1/4 c. of the pecans in slow cooker; top with half of the biscuit mixture. Pour one-third of the butter mixture over biscuits in cooker. Repeat with 1/4 c. pecans and remaining biscuit mixture. Pour remaining butter mixture over biscuits, and sprinkle with remaining 1/4 c. pecans. 4 Place 5-7 paper towels under the lid to collect the condensation. 5 Cover. Cook on High for 1 1/2 to 2 hours or until knife inserted in center comes out clean and biscuits are no longer doughy in center. (Optional: For even crocking, halfway through crocking time, twist crock around half way.) Tops of biscuits will be moist. Turn off cooker. 6 Replace with paper towels and lid, letting stand for 10 minutes. 7 While monkey bread is standing for 10 minutes, heat cream just to boiling. Remove from heat. Stir in chocolate chips until smooth or heat hot fudge to drizzle over the bread. 8 Run a knife around edge of crock; turn bread upside down onto heatproof serving plate. 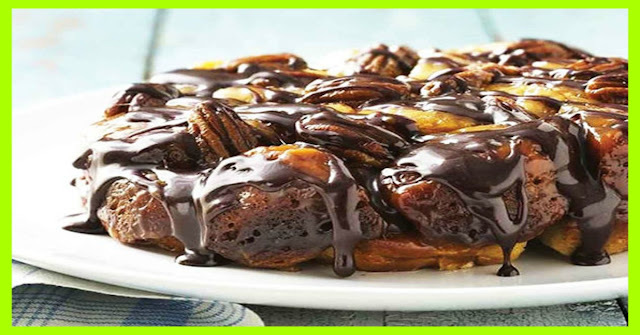 9 Drizzle chocolate over monkey bread.